One morning the most delightful book arrived for review. And to review it has given me the greatest pleasure because it is both visually stunning and yet full of the most useful travelling information written in the simplest format I have ever seen. 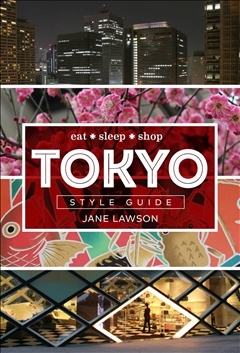 It’s called Tokyo Style Guide (eat, sleep, shop) and is written by experienced travel writer and chef Jane Lawson. The hardback cover is an artwork in itself and the format is compact and user-friendly. It would adorn any coffee table because of it’s aesthetically pleasing cover alone – but wait till you get inside! Focusing on the diverse and visually stunning city of Tokyo alone, the book is divided into chapters which show you how to get around the various districts by walking or public transport. Attention to detail covers every possible question the first time traveller to Tokyo would have. What to wear, how to communicate, how to buy your local travel passes, the seasons and the customs – as well as the most important things – where and how to shop, where to stay and where to eat. Each district chapter comes with a short intro, plus a really clear map with numbers on it. These numbers match up with the step by step journey you will take and also provides stunning photographs of what you will find at each destination. Its’ a real one two three type of guide, and would be wonderful for the slightly nervous first-time traveller as well as for the more seasoned traveller who has, even more, gems to discover. And as it is possible to walk most of these places then it is even more ‘hands on’. Jane Lawson has been visiting Japan for over thirty years and you can see this throughout this beautiful book. The photos are nothing short of exquisite and provide a sumptuous visual banquet for the eyes. Quirky and funky shops selling fashion that we would never see anywhere else. Gorgeously merchandised shops show row upon row of beautiful things. I have always loved Japanese decor and design and the interiors of these shops had me utterly drooling. And then there is Jane’s advice on the eateries and cafes which are well worth a visit. Chapter upon chapter of gorgeous photographs entice the reader to keep on flicking through to the next delight. There are suggestions of places to stay with photographs to describe them. Traditionally dressed geisha girls contrast with the uber fashionable young people. The buildings, the vibrant colours and the sense of both ancient and modern bring a unique and special city to life. Whether you are a people watcher, a foodie or a shopper – this book has something for you. Being a slightly nervous traveller myself, a book like this is a comforting and informative ally. If I only have to follow a numbered map and find the corresponding picture and information, then I am more encouraged to be adventurous. And this is how the Tokyo Style Guide makes me feel. Having Jane also provide little anecdotes, thoughts and pearls of wisdom somehow makes you feel like you have your travel guide right along with you, and that is immensely comforting for many travellers. The book concludes with a glossary and suggestions for other places you might like to visit when in Japan. I love Tokyo Style Guide as a stand alone book just to flick through and enjoy the photographs and travel stories – however, it is also an immensely practical book and would be a wonderful gift for the soon to be traveller or just to help whet your travel appetite. Well done Jane Lawson on your attention to detail and ability to provide concise and useful information in such a beautiful but user-friendly way. It is available now from Dymocks. Click here to learn more.